On Monday, April 15, the Arizona House of Representatives will present House Resolution HR2002 declaring April 14–20, 2019, Arizona Water Professionals Appreciation Week. The resolution, sponsored by Rep. Rosanna Gabaldón (D-Sahuarita), will be presented in conjunction with the AZ Water Association’s 92nd Annual Conference and Exhibition held in Phoenix April 16-18. M&A is proud to participate in and support both the conference and AZ Water Professionals Appreciation Week honoring the thousands of individuals working in water-related fields throughout the state. 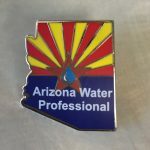 Conference attendees who stop by the AZ Water Resources Committee table will receive a free Arizona Water Professional lapel pin designed specifically for this occasion. Supplies are limited. For more information, visit arizonawaterprofessionals.com or contact Juliet.